A post on a beauty board got me to thinking. I've been a shampoo 'ho for years...even when I find a nice one, such as Alba Hawaiian Plumeria or Honeydew shampoo, or Avalon Organics Lemon clarifying, my eye invariably wanders, toward the end of the bottle. But when it comes to hair conditioners, I'm suddenly next to being a nun. Conditioners are harder to find than shampoos. Or I should say, products that remain on your hair or skin are more important than those that merely wash and then leave. 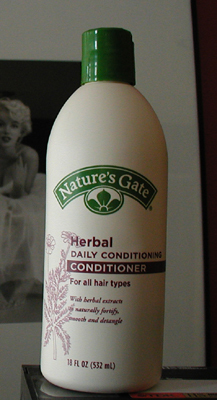 I've been going with Nature's Gate Herbal hair conditioner a little over six months now. It's a bit tricky to use, in that only the scantest dab works. Too much feels like water but turns my hair greasy. Before that I used Pantene Smooth & Sleek, Neutrogena Clean Volume, Infusium 23 daily (not the leave-in), Smash the Finisher (that goes back a ways--scroll down). That's about it, over the past nine years or so. Will I remain with Nature's Gate? It does work. I color my hair (permanent), so it has to address dry ends. Yet my scalp is naturally oily, so it can't goop too much. I have no patience for comb-outs; won't do anything special with my hair, beyond using Feria deep conditioner over the several days after I color. It worked even when I went on vacation to a tropical place (i.e. you wash your hair twice per day). No tangling, easy comb-out, no weigh-down, economical (and cheap), reasonably easy to find at a b & m store, no silicones even...see? I've already convinced myself to stay with it. It's strongly scented; sniff the bottle before buying.